Isn't she cute!?!? 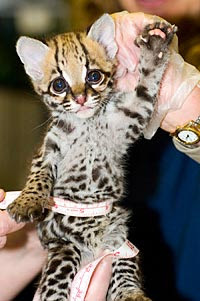 This is one of two Ocelot kittens that just turned 18 weeks old at the Woodland Park Zoo. I think they are absolutely adorable!! I just want to love them and squeeze them and hold them forever. Well maybe not but still, super cute!! I want to take Preston to see them so bad. The zoo is in Seattle and only a four hour drive from us. I totally think it's worth it to head over there to see these little girls before they're all grown up. And I've almost got Brad convinced that we should make this a priority. Now I just have to figure out when they will be released to the public, so that I can plan our trip. That makes the third trip to Seattle that I have to look forward to in the next few months. You can read more about these adorable little kittens here.